There’re only 41 sleeps left till Christmas and you all know what that means... It’s time to bring some fabulous festive cheer to your office and officially start the Christmas countdown. A lot of people work right up until Christmas Eve and probably spend more time at work then they do at home! So decorating your office is a great way to spread the Christmas cheer and keep peoples spirits up. It’s the most wonderful time of the year and we’re here to make it even more wonderful with our winter and Christmas removable wallpaper. Our removable Christmas wall murals are perfect for decorating your office space in the lead up to the big day. Our peel and stick wallpaper is a popular choice when it comes to Christmas because it’s so quick and easy to install and you can also easily remove it once the season is over. This self-adhesive material will let you create your very own magical winter wonderland without taking up too much time to install or causing a huge mess. Christmas decorations are part of the magic of the season so let our Christmas wallpaper murals help you to create an enchanting environment in your office. We know full on sparkly, shiny, glitter filled Christmas décor is not everyone’s cup of tea and that’s absolutely ok. Because here at Wallsauce we have a Christmas wallpaper mural for the Whovilles and the Grinches of your office! You know your office is Christmas-mad if as soon as bonfire night is over everyone is humming Christmas songs and talking about shopping for presents. For a team like that only our most magical, colourful, Christmassy wallpaper murals will do. However, if your office is outnumbered by people who find too many Christmas decorations distracting and even the word ‘Christmas’ makes them huff and puff then our more understated and muted murals will be a great option for you. We have a collection of Christmas wall murals suited to everyone’s tastes. So firstly let’s check out four glitz and glam Christmas wallpaper murals followed by four more subtle styles. 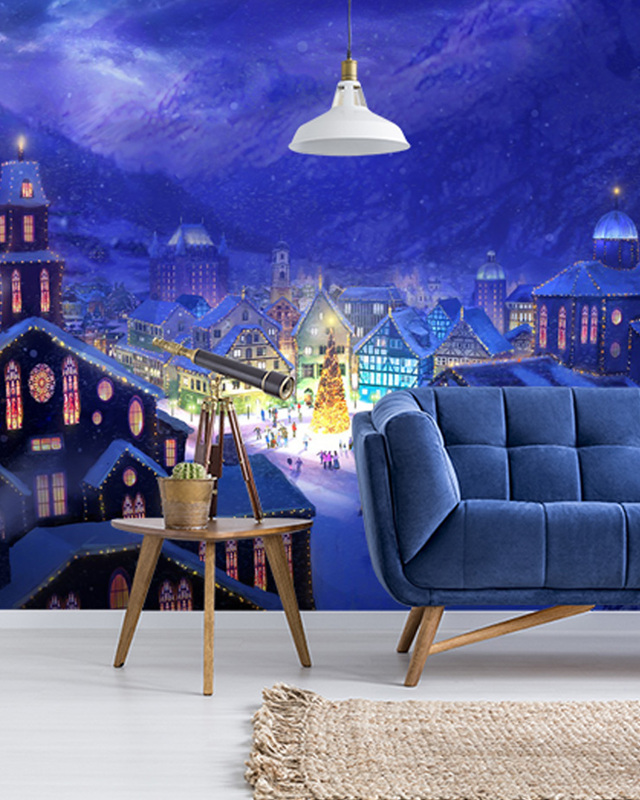 Create the ultimate Christmas makeover with this mesmerising Christmas Town wallpaper mural by Philip Straub. If you’re going for the full-on Christmas shebang then look no further. 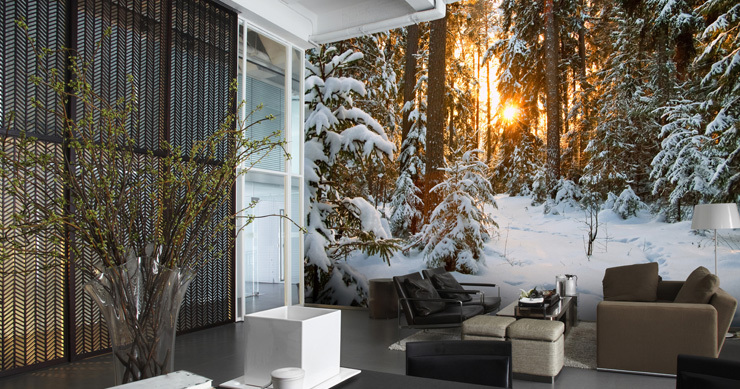 You can transform your office into something out of a Christmas movie scene with this stunning wall mural. The snowy mountains in the background, the Christmas lights glowing, the huge Christmas tree in the centre; it really does look like a town alive with the joy of Christmas. It has such a warm, happy, cosy feel to it and it will make a glorious addition to your office. Another option for going all out is this gorgeous Winter Wonderland mural. The magical castle, the thick snow, the towering trees, the family of polar bears laid out across the bottom of the mural – literally everything about this wallpaper mural screams: Christmas is coming. As an alternative, opt for this All About Christmas mural. As the name eludes this wallpaper mural is all about Christmas! There are snowmen, reindeers, Christmas trees and presents making this mural a Christmas must-have. It’s a cool repeat pattern style but it isn’t too over the top thanks to the colour scheme. The balance of the busy pattern with the three choices of colours: Blue, white and black, make this a very merry wall mural. Snowbound Deer is another great pattern wallpaper to decorate this festive season. This snowy scene with cute blue and white reindeers with stars in-between and Christmas trees will make a lovely addition to your office. You can keep in with the theme and have blue and silver tinsel around your desks for the ultimate festive look. 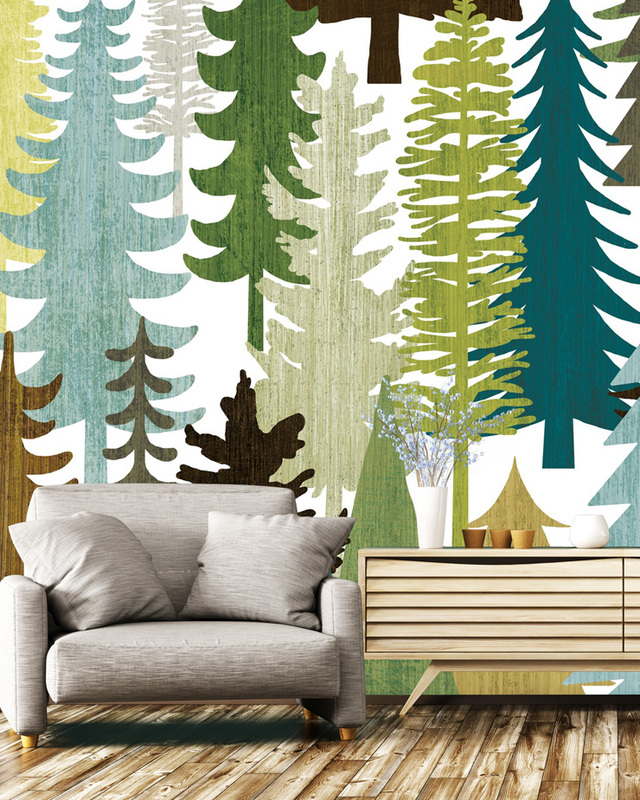 It doesn’t get much simpler than this Christmas tree forest pattern wallpaper mural. Even the hard-core Grinches should be able to tolerate this modest pattern. It has a very clean and crisp feel to it with the white background. This wall mural doesn’t exactly scream CHRISTMAS in your face but it has that frosty winter vibe to it. If you work in a vet or know your team are animal lovers (who isn’t) then this Artic Sundown mural by Adrian Chesterman will be just the one for you. This stunning scene includes polar bears, penguins, orcas and birds. The blend of colours is done so beautifully and you go for an overall animal theme and decorate the rest of your office with animal inspired décor. You really can’t go wrong with this Christmas tree inspired wallpaper mural. The colours are bright but the design is fairly simple with a pattern of Christmas trees. The background is a traditional Christmas red but the trees break away from the traditional green and are a lovely mix of light multi-coloured trees in big and small sizes. With a simple colour scheme, some trees and just one little reindeer this wall mural is great for that understated Christmas look. It will look fantastic in your main office or you could have it in your canteen or breakout area. If you haven’t found a wall mural for your office from this list then we have plenty more Christmas wall murals for you to choose from. Remember when it comes to removal our peel and stick wallpaper is super easy to take off. All you have to do is wipe the wallpaper with a wet sponge and it will peel off the wall effortlessly without damaging the paintwork or plaster underneath. Yay! Then you just need to wipe the stripped wall down with a sponge to remove any trace of adhesive and that’s job done. For more fun Christmas decoration inspiration check out our blog post, Bedroom Wallpaper: Getting Rooms Ready For Guests This Christmas. 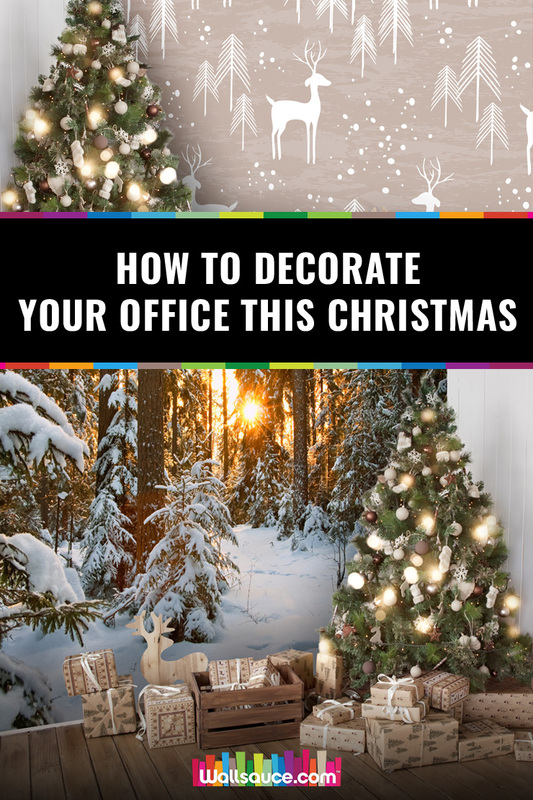 Alternatively, please feel free to add your festive office ideas in the comments box below.